This is my self-made definition of service, developed through years of volunteering throughout my childhood. As a freshman last year, I was able to pursue new community service opportunities, and in doing so realized a multitude of things; mainly that my definition should be expanded. Community service does not just benefit the greater community, it benefits the individual. While the intentions of community service may be altruistic, the effects of joy, value, and fulfillment to the individual should not be overlooked. The Agroecology Farm at NC State is a small organic farm dedicated to growing fresh produce for NC State’s dining halls. As a teen, I had unwittingly visited the Agroecology Farm since it connects to the Yates Mill Pond county park that I frequented. I loved the small, idyllic view of it: the herb garden in the front, bluebirds sitting on the fence that protected the vines and rows of edible goodness. When I went to volunteer for the first time last fall semester, I met the wonderful farm manager, Alison Reeves. She showed me the hoophouse where a maze of tomato vines greeted us. I picked two big buckets worth of tomatoes, searching through the green leaves for golden gems. 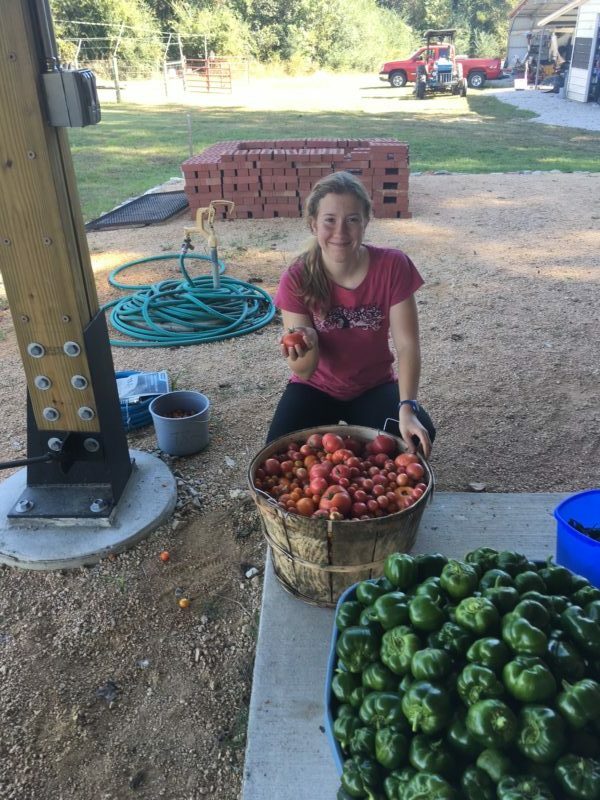 It was hot and sticky work, but I felt a sense of reward when I saw the picked-clean vines and knew that the tomatoes would feed hard-working students on campus. The next week in Fountain Dining Hall, I was overjoyed to see a heaping pile of the sun-golden tomatoes at the salad bar! The local produce that I picked had come full circle to end up in the mouths of me and my peers. This service opportunity developed my knowledge of farming, made me see the true value of local agriculture, and allowed me to enjoy the outdoors. Urban agriculture is one of the primary methods of food sustainability. Produce that is grown close to the consumer limits the amount of energy used to transport it. The majority of energy used in transportation is gasoline which releases carbon dioxide into the atmosphere and further contributes to human-caused climate change. So, not only is volunteering at the Agroecology Farm emotionally beneficial, it contributes to local agriculture efforts and thus a more sustainable way of living. As I continue to expand my community service activities, I am further surprised by the myriad ways it is necessary. The other service opportunity I was part of was Service Raleigh. Service Raleigh is the largest volunteering event on campus. 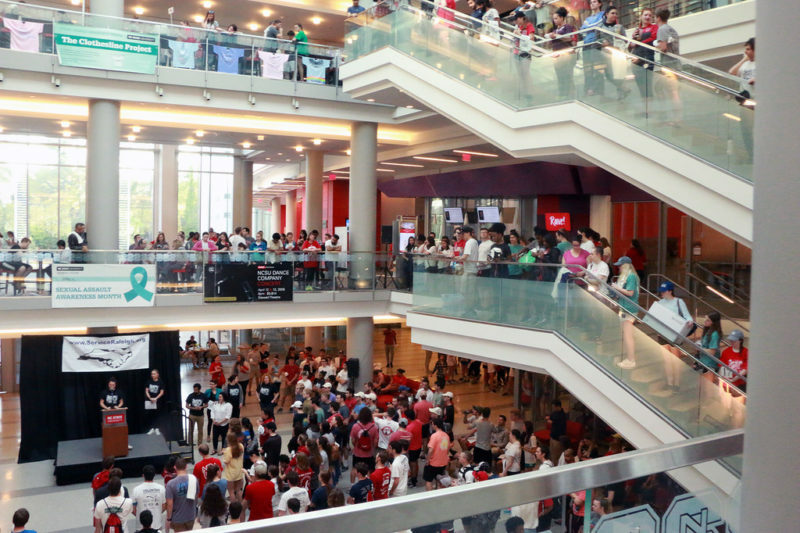 On one Saturday in April, over 2,000 students gather in Talley and are transported to dozens of different organizations in Raleigh. After several hours of community service, the students eat lunch and return to campus. I was on the Partners Committee, so I was in charge of emailing organizations who had partnered with NC State in the past, while also finding other organizations who may be interested in having volunteers come to their sites and complete a small project. Being from Raleigh, I was excited to contact various places that I had been to or even volunteered with before. With Service Raleigh, not only was I able to help with the planning of the event, I was also a site leader for the day itself. I organized 40 students into different cars, and we all went to Enloe High School. The kind teachers instructed us to mulch and build benches for a small park area they were creating by one of the parking lots. I had so much fun using a shovel to pour the rich mulch onto the landscape, transforming it into a beautiful, calm space for high school students. Along with doing community service last year, I got an internship with the Sustainability Office doing a greenhouse gas inventory for NC State’s 2016-2017 fiscal year. My task was to collect data from various university staff on the energy use of buildings, number of farm animals, and food, to name a few. The greenhouse gas inventory is a part of the Climate Action Plan, a goal set by NC State under a national collaborative to reduce carbon emissions. NC State’s goal is to become carbon-neutral by 2050. This means that the energy we produce is either renewable, such as solar or wind energy, or what nonrenewable energy is used is offset by different activities that take carbon out of the atmosphere (planting/obtaining forests) or reduce waste (composting). I really enjoyed this internship, because I was contributing to an effort that will shape future students’ campus experience. By collecting this data, the resulting report will be used to enact more energy-efficient policies. I am writing to you, dear reader. I want the unity that community service creates to encompass each one of you. Why mention a job when I am writing about community service? In this instance, I was fortunate to be paid, but the side benefits were the same as the volunteer work I had gladly done for free. This internship made me further realize the importance of communal unity and local action. The university is trying to be more environmentally conscious, thus improving its community and those around it. Climate change is an issue that affects all of us, and doing small things to reduce our carbon emissions matters. So, the university is doing its social part to be environmentally active. I was in charge of collecting data from a multitude of areas, and this collaboration is vital in doing good. What will we, as students, do? Doing good isn’t solely the environment, or service, or local produce. It’s everything. It’s all of us. It’s helping as much as we can! Serving locally can have indirect benefits to the environment like stimulating local produce and consumption. Or it can be creating green spaces, a carbon sequester. Or it can be reading to children at a Raleigh elementary school. The sum of all of these examples is difficult to define, but maybe there doesn’t have to be a definition. There doesn’t need to be a definition, a box for these things, only the effect they have on us and the world we live in. And that effect is positive. Service is a positive being, and local community service may have other positive effects as well, including environmentally helping, social justice, sustainability. This internship overall made me realize the importance of philanthropically and environmentally aiding my community. My experience with service has been amazing, and I couldn’t imagine a life without it. I feel valued by those I am intending to help. My incoming purpose is a willingness to aid in whatever is needed. I come out of each service opportunity satisfied that I have helped, while also feeling valued for my individuality, and get joy from learning about every other volunteer and worker. I am writing to you, dear reader. I want the unity that community service creates to encompass each one of you. So, go out, find a way to help out the community, whether it be with NC State, Raleigh, or an organization back home. You can donate to different causes (Hurricane Florence is still impacting many families–donate here: North Carolina Disaster Relief Fund), but I have never found that as fulfilling as actually going and helping someone. The Food Recovery Network and the Feed the Pack food pantry are two ways on campus to get involved with food security. The Agroecology Farm and SOUL gardens are NC State sites for you to get your hands dirty and be outside. VOLAR is a club on campus for Spanish-speakers to go to elementary schools in the area and reach out to Hispanic students. There is an amazing Habitat for Humanity chapter on campus as well, and a Best Buddies chapter (an organization that pairs volunteers to people with disabilities). 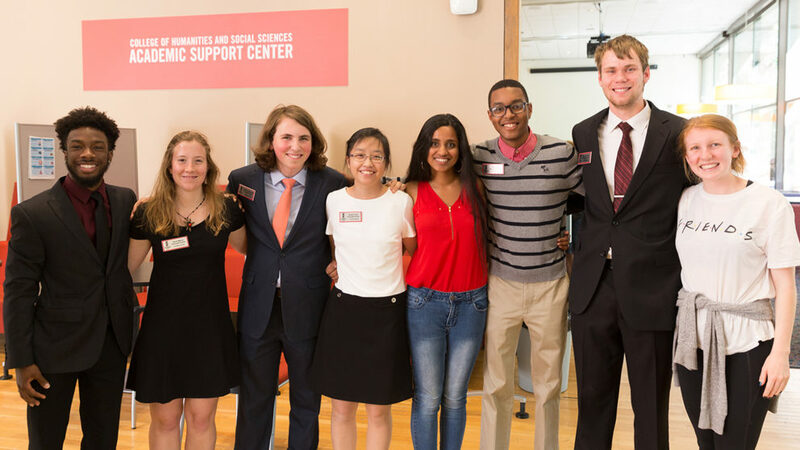 NC State’s Get Involved website gives information on all of the clubs and volunteer opportunities on campus. There are a plethora of ways to do service. Whether your reason is philanthropic, or has a more environmental facet to it that my service opportunities often include, or if you are in an emotional or academic rut and think that community service will make you feel better (it will), just try. Community service can be completely tailored to what you are willing/wanting to do. It will leave you feeling more valued, joyful, and knowledgeable. You are paying it forward by having a positive impact in our community.